Furnished, preset cottage style tent for two persons. There are 4 tents total. Three tents have 1 Queen Bed, One tent has 2 Twin Beds. Each tent has bedding and furniture. Please bring your own towels. Each tent includes cooler, fan, lamp, and power for cell phone charging. All the amenities that the Terraces offer but with none of the hassle of bringing your own RV or Tent. Set in an exclusive secluded area within the Terraces. Glamping is only sold directly through a Live Nation sales representative. 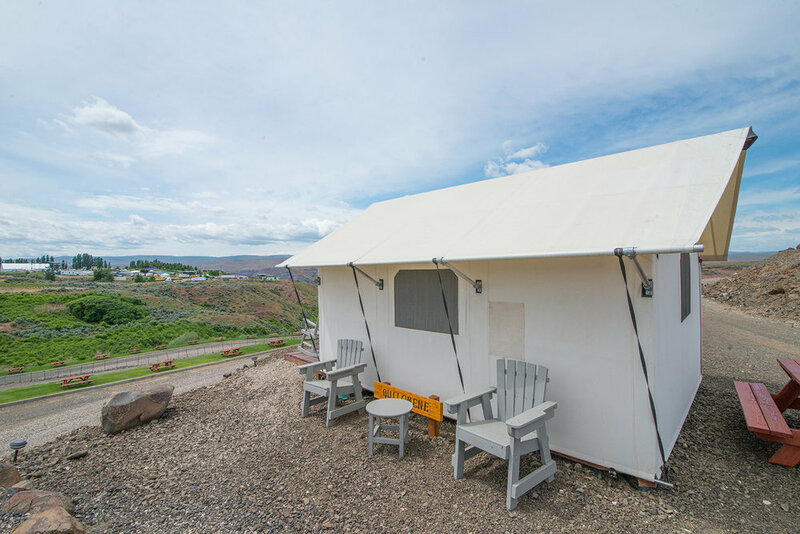 The Gorge Amphitheatre will not honor Glamping sold from secondary market websites. Glamping does not include access to the concert venue. Concert/Festival Admission is a separate purchase. Sign up for our waiting list and a representative will reach out with more information on how to make a purchase. Check out The Gorge Oasis for another premium camping option!